May 20, 2014 - FirmTek combines their popular ThunderTek/PX Thunderbolt expansion chassis with the recently introduced SeriTek/6G2+2, a SATA adapter which supports external eSATA enclosures while incorporating a clever 30-year-old idea: Letting you place drives directly onto the controller to save space and reduce complexity. A flexible all-in-one Thunderbolt storage solution accommodating two high-speed 2.5" SSD, HDD, or SSHDs internally, the ThunderTek/PX2+2 also provides two external eSATA ports for connecting external direct-connect and port-multiplier eSATA enclosures. Enjoy the best of both worlds - internal SSD and external SeriTek/5PM connections. May 14, 2014 - FirmTek, LLC, is shipping a new take on a 30-year old idea: Letting you place drives directly on the controller to save space and reduce complexity. The SeriTek/6G2+2 provides mounting points for two 2.5" HDD, SSD, or SSHD SATA drives, along with two external hot-swap eSATA ports supporting direct-connect and port-multiplication enclosures - all with a half-length PCIe card. It is Windows compatible and Mac OS X bootable, whether installed inside a PC or legacy Mac Pro with a PCIe 2.0 4-lane or higher slot, or mounted in a Thunderbolt PCIe expansion chassis. December 16, 2013 - FirmTek, LLC, today ships ThunderTek/PX-Q6G. This new Thunderbolt to 4-Port eSATA adapter supports both direct-connect and port-multiplier enclosures. Transfer HD movies in less than 30 seconds or backup a terabyte of content in less than 5 minutes. All of this is possible with Thunderbolt. Instantly access multiple projects stored in existing eSATA enclosures and avoid wasting hours transferring data to new enclosures. Extending the life of eSATA enclosures helps save the planet by keeping electronic waste to a minimum while saving time, money and equipment downtime. March 21, 2013 - FirmTek, LLC, today ships the bus-powered, miniSwap/U3 with blazing-fast performance up to 440MB/s for new computers with USB 3.0 and legacy computers with USB 2.0 ports. An industry first and perfect for 2.5" solid state (SSD) and hard disk drives (HDD). The enclosure provides trayless, hot-swap, SuperSpeed USB 3.0 external enclosure support for Mac and PC computers. Awarded MacWorld Editor's Choice Award - June 2013. December 11, 2012 - FirmTek, LLC, announces the SeriTek/Q6G Mac OS X Bootable, High Performance, 4-Port eSATA 6G Storage Adapter for Mac and Windows is Now Available. The SeriTek/Q6G is Mac OS X Bootable, whether installed inside the Apple Mac Pro or a Thunderbolt PCIe expansion chassis, with or without SATA port-multiplication. Windows 7 is supported with Bootcamp or desktop PCs with an available PCI-Express 2.0 4x slot. With real world storage performance results in excess of 500MB/s per channel, the SeriTek/Q6G offers a new level of performance for professional customers. January 10, 2012 - FirmTek, LLC, announces the miniSwap/ES, the Ultimate Trayless, Dual Bay, Hot-Swap, 2.5-Inch External 6G Serial ATA Enclosure for SSD and SATA hard disks. Instantly Mount SSD and/or 2.5" SATA Hard Disks No tray required, just insert up to two bare SSD or 2.5" hard drives and close the bay door! That's it! No Tray, No Screws & No Tools required. The miniSwap/ES is compatible with virtually every external SATA host adapter and built-in motherboard SATA ports. This new product is designed to excel with audio/video editing, computer animation, digital photography, portable computing, storage expansion, backup and any application where external hot swap, high performance, data storage is desirable. April 20, 2011 - Today FirmTek, LLC announced the SeriTek/6G ExpressCard is now shipping. The SeriTek/6G provides a new level of ExpressCard/34 performance, offering recorded Read transfer rates over 380MB/s when matched with the 2011 Apple 17-inch MacBook Pro. This 2-port eSATA ExpressCard is ideal for audio/video editing, photography, large media content libraries, storage expansion, backup and any application where external, hot swap, high performance, data storage is desirable. Compatible with the 2011 MacBook Pro (8,3) using Snow Leopard 10.6.x and Windows PC notebooks with an availble ExpressCard/34 slot. Supports high speed direct connect enclosures like the SeriTek/2EN2 and port multiplier enclosures like the FirmTek SeriTek/5PM. November 25, 2010 - Diglloyd has published a detailed review of the Hitachi 3TB Deskstar 7K3000. The article performance tests up to five Hitachi 3TB SATA hard disks with the internal Apple Mac Pro SATA ports and the SeriTek/2ME4-E. The RAID-0 stripping scalability graph demonstrates, "The FirmTek SeriTek 2ME4-E PCIe card is clearly the way to go for 5 or more drives". Read the full article and view the performance graph. FirmTek, LLC, is now shipping the SeriTek/e6G. This 2-port eSATA host adapter is designed for audio/video editing, photography, large media content libraries, storage expansion, backup and any application where external, hot swap, data storage is desirable. The new FirmTek 64-bit SeriTek/e6G driver provides a low power, high performance native PCIe 2.0 to Serial ATA interface. Compatible with the Apple Mac Pro and the PCIe based PowerMac G5 (11,2). Supports direct connect enclosures like the SeriTek/2EN2 and port multiplier enclosures like the FirmTek SeriTek/5PM. FirmTek, LLC, is now shipping the SeriTek/2ME4-E. This 4-port eSATA host adapter is ideal for audio/video editing, photography, large media content libraries, storage expansion, backup and any application where external, hot swap, high performance, data storage is desirable. The new FirmTek 64-bit SeriTek/2ME4-E driver is built from the ground up to take advantage of Snow Leopard while providing a low power, ultra high performance native PCIe to Serial ATA interface. Compatible with all Apple Mac Pro models and the PCIe based PowerMac G5 (11,2). Supports high speed direct connect enclosures like the SeriTek/2eEN4 and port multiplier enclosures like the FirmTek SeriTek/5PM. FirmTek, LLC, one of the world's leading developers of Serial ATA solutions for Apple Macintosh and PC computers, announced today (September 23, 2009) that the SeriTek/2SE2-E and the SeriTek/2SM2 are fully Snow Leopard compatible. The new 5.4.x series of FirmTek drivers provides 32-bit and 64-bit Mac OS X 10.6.x Snow Leopard compatibility with FirmTek ExpressCard and PCI-Express eSATA controllers. Third Party S.M.A.R.T application support is also incorporated in the new FirmTek driver. FirmTek announced the SeriTek/SpyderHUB at NAB 2008. This innovative new product provides instant boot capability for external direct connect eSATA enclosures while allowing them to connect to any computer with FireWire 800/400 or USB 2.0 data ports. The SeriTek/SpyderHUB is the first device that provides every computer with the ability to connect to dual direct connect eSATA enclosures while also supporting hardware RAID and FireWire daisy chain capability. MacWorld has awarded the SeriTek/5PM five stars and selected it for the MacWorld Editors Choice Award. On page 44 of the May 2008 MacWorld issue, Cliff Joseph writes, "the SeriTek/5PM is ideal for professional users who need greater storage capacity, performance and data security". Looking for more data of this hot new product? FirmTek has published performance data for the SeriTek/5PM. FirmTek, LLC, a pioneer and leader in Serial ATA (SATA) storage solutions today announced that Hitachi Global Storage Technologies has selected FirmTek to participate in the Hard Drive by Hitachi Ingredient Brand Program. The "Hard Drive by Hitachi" logo will now be featured on the FirmTek SeriTek/5PM enclosure, which has been validated extensively with Hitachi one-terabyte (1TB) Serial ATA (SATA) Ultrastar¨ A7K1000 hard drives during the program qualification process. The SeriTek/5PM provides best-in-class features including a unique heat management system, user selectable 3-speed fan control, front-panel power switch, temperature and fan failure alarms, a true hot swappable backplane design with no internal cabling and an ultra small footprint! The SeriTek/2SE4 provides bootable SATA Port Multiplier Support to PCI-X Systems! 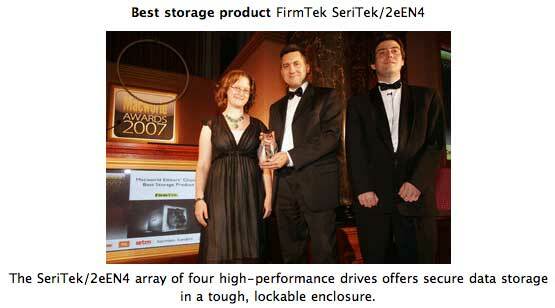 MacWorld London, England (July 12, 2007) -- FirmTek, LLC, a pioneer and leader in Serial ATA (SATA) storage solutions for Windows and Macintosh platforms, today announced that Macworld Magazine's United Kingdom edition selected the SeriTek/2eEN4 as the best storage solution among all evaluated during the year 2006. Macworld Magazine's awards have become the primary recognition event in the Macintosh developer community, and FirmTek surpassed many large and well-known brands to attain this award. San Francisco, California (January 31, 2007) -- FirmTek, LLC, a pioneer and leader in Serial ATA (SATA) storage solutions for Windows and Macintosh platforms, today announced that Small Business Technology Magazine, the only print and digital publication in the U.S. focusing on the technology needs of small businesses, has awarded the SeriTek/2ENSM2-E as a Finalist in its 2006 Product of the Year Awards, its annual salute to the best technology products and services for small business. Honorees are profiled online and in print as part of Small Business Technology Magazine's Best of the Year Issue and 2007 Buyer's Guide, available at http://www.sbtechnologymagazine.org. The SeriTek/2EN2 Unlimited storage possibilities in a small form-factor package. The SeriTek/2SM2-E extends SATA's astounding performance beyond the desktop. The SeriTek/2SE2-E is a Serial ATA host adapter fully compatible with the new PCI Express bus architecture found in Apple's Late 2005 PowerMac G5 and the Mac Pro. Announcing the new SeriTek/2eEN4 Four-Bay eSATA External Serial ATA Enclosure. FirmTek introduces the SeriTek/1V4 and SeriTek/1eVE4, four-port high-performance PCI-X internal and external Serial ATA host adapters for the Macintosh. FirmTek announces SeriTek/1eSE2, the first external Serial ATA controller for the Macintosh. Offers exclusive hot-swap capabilities! FirmTek now introduces SeriTek/1S2, our first offering in the SeriTek line of Serial ATA controllers. Thanks to everyone who made this possible!